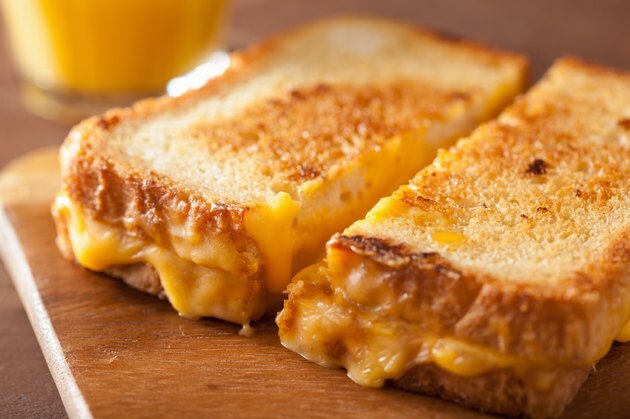 A cheese sandwich generally consists of one or more slices of cheese between two pieces of bread. It's frequently cooked in a pan or on an open grill, causing the bread to toast and the cheese to melt. A cheese sandwich consisting of two slices of white sandwich bread weighing 1 oz. each and a slice of American cheese weighing 1 oz. contains 261 calories, which is about 13 percent of the daily value for calories. This daily value assumes a daily diet of 2,000 calories, according to Fatsecret. A cheese sandwich provides 114 calories from fat, 110 calories from carbohydrates and the remaining 37 calories from protein. The fat content in a cheese sandwich is 12.67 g, which is about 19 percent of the daily value for fat. It also has 27.6 g of carbohydrates, or about 9 percent of the daily value for carbohydrates. The protein content in a cheese sandwich is 9.1 g, 18 percent of the daily value for protein. A cheese sandwich contains 734 mg of sodium, which is about 31 percent of the daily value for sodium. It also has 23 percent of the daily value for calcium and 11 percent of the daily value for iron.